Replacing animal products in the food system is a multi-billion-dollar industry, and it’s only getting bigger. 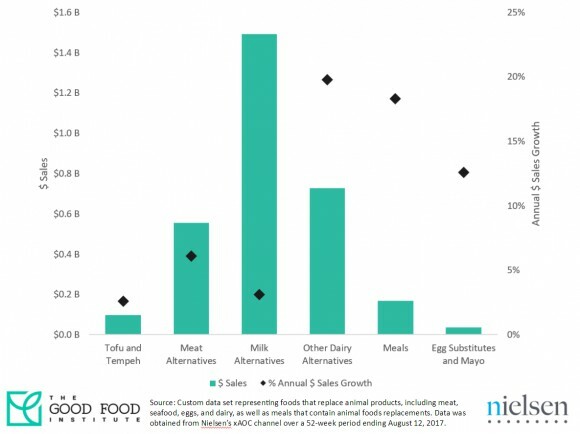 Today, The Good Food Institute and our friends at the Plant Based Foods Association (PBFA) released newly commissioned data about the market for plant-based meat, dairy, and eggs. The data comes from Nielsen, a leading research group. Refrigerated plant-based meats and plant-based dairy products like coconut yogurt and cashew cheese (but excluding milks) won out as the fastest-growing categories with a 25% and 20% jump in sales, respectively. -The plant-based foods category grew 8.1% in the past year, topping $3.1 billion in sales. Think your business could ride on this rising tide? Apply to join our GFIdeas entrepreneur group to collaborate with peers and get expert support. To learn more about GFI’s work supporting the growth of the plant-based industry, check out what we do. Sign up to stay current on the work of GFI.